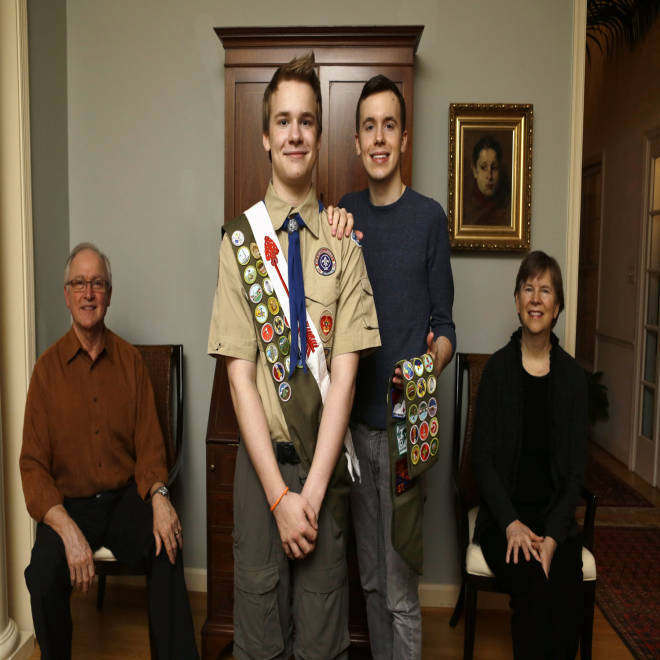 Pascal Tessier, 16, center left, a Scout, and his brother Lucien Tessier, 20, who had earned the rank of Eagle Scout, pose for a portrait with their parents, Oliver Tessier, left, and Tracie Felker, at their home in Kensington, Maryland, on Monday. The two Tessier boys enjoyed Cub Scouts, progressed to Boy Scouts, and continued to thrive there even as many in their troop became aware that each boy was gay. Published at 4:45 a.m. ET: Special prayers have been urged, petitions handed in, phone calls placed and pleas for a delay made, all over a decision on an issue that has rocked one of America’s most popular youth organizations: whether or not gays can join the Boy Scouts. A decision by national Scout leaders is expected Wednesday. Some fear an unwanted new era, while others are welcoming what they believe is an overdue change that comes amid other recent gains for the LGBT rights movement nationwide. Advocates on both sides of the issue have stepped up their campaigns ahead of the BSA's final decision: They’ve encouraged their backers to make their voices heard through a phone-in and email deluge. A conservative group, the Family Research Council, said that it and 41 other groups ran a newspaper ad on Monday asking the BSA not to change the policy, and some conservative religious groups have urged their supporters to join in prayer to ask the board not to accept gays. Ryan Andresen had recently completed the requirements to earning his Eagle Scout award, including his final project of building a "tolerance wall" for victims of bullying like himself, but his Scoutmaster would not sign off on honoring him with the Boy Scouts' highest ranking because he is gay, his mother said. 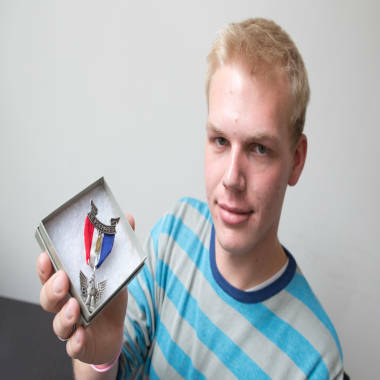 Here, Ryan holds an Eagle Scout pin that was sent to him from a supporter. A coalition of Boy Scouts councils representing some 540,000 youth -- or 20 percent of the organization’s 2.6 million active Scouts -- asked the national organization on Monday to delay a decision on ending the controversial policy, saying it was concerned “about the pace at which such actions are being taken,” according to a statement posted on the website of the Utah-based Great Salt Lake Council. Roger “Sing” Oldham, spokesman for the conservative Southern Baptist Convention Executive Committee, said the outpouring of feedback on the issue came as no surprise to him since his group felt the BSA had not allowed opponents of the change to weigh in on the proposal, which was announced just a little more than one week ago and was being reviewed by national leaders. Oldham said he had spoken with some troop leaders, pastors and parents who have expressed concern about the way forward if gays are allowed, particularly those units that will try to maintain the ban locally as would be permitted under the proposal. For more than two-thirds of Scouting groups affiliated with religious bodies, faith plays a large role in the private youth organization. Some have said they will even leave the organization over the issue. But another mother, of a Boy Scout and two Cub Scouts, said she had “been torn for years” over the policy since her own mother is a lesbian and allowing gays would be a relief. “I am very happy about the things my children have learned and the tools they have been given from the program,” Gina Beaudry, 37, of Raleigh, N.C., who will be the Cub Scoutmaster for her sons pack this year, wrote in an email to NBC News. The proposed policy change comes just seven months after the BSA said it was sticking with its ban following a confidential two-year review. Both cases made national headlines, roiling the private youth organization. Some critics pointed to declining membership numbers as a sign that families were being turned off over the issue. The controversy also prompted a few hundred Eagle Scouts to turn in their hard-earned regalia in protest of the ban, which the U.S. Supreme Court upheld in 2000.